AIR - DALE ENGINEERING CO. (PTY) LTD. The only breeze sure to keep you cool and comfortable in summer, combined with a company that won't raise your temperature either! Air-Dale Engineering Co. (Pty) Ltd., trading as COOL BREEZE AIR CONDITIONING is well qualified to address your evaporative cooling needs. We commenced business in 1964 and have, over the years, gained a wealth of knowledge and experience. 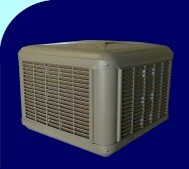 We carry a comprehensive range of the most up to date evaporative coolers. Spares for all units are readily available and we offer a free design service, which can trim hours off the time you spend preparing quotes. Evaporative cooling is as old and wonderful as nature itself. Just experience a cool breeze of freshly cleaned air just after a rain storm and you'll know what we're talking about. Evaporative cooling has been around a long time, so in that sense, we're not selling anything new. Even the ancient Egyptians used it! Over the last few years the design of evaporative coolers has been greatly improved. Innovative products have enhanced the performance and lifespan of this type of cooling system and the result is that evaporative cooling is taking the market place by storm. Due to the high and maintained efficiency of our coolers, comfort conditions are easily maintained throughout the summer months in most areas of South Africa. Systems are becoming more modular, and this results in quick and easy installations. Cool Breeze systems are long lasting, and are supplied with a casing warranty of 10 years! Internal components carry a 2 year warranty. Running and maintenance costs are barely worth mentioning. These extremely well engineered units are ideal for cooling factories, warehouses, offices, commercial premises, churches, houses and many other applications. Our prices are equally good! You simply won't find better value for your money. Evaporative coolers can provide indoor temperatures that would cost up to 6 times as much using conventional refrigerative cooling units. Our prices withstand all competition, and we invite you to compare our products with those of other suppliers. Contact us and we'll happily give you the names of other companies in our industry - this way you'll be able to see and compare for yourselves. We invite you to visit our factory as we would really like an opportunity to demonstrate these remarkable coolers. Please give Stuart, Violet, Samantha, Lynda, Gordon or Alan a call at (011) 887-8985 or fax us at (011) 887-5013. We're situated at 10 Rautenbach Avenue in Wynberg, Johannesburg, South Africa. We aim to please! You'll find our products and service can't be beat! We're honest and upfront and lead the field, having been in business since 1964!